We offer reliable Electrical Products to many customers in India and abroad! » CVCC Current Source for small electroplating Jobs. 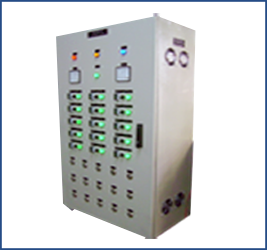 (Category – Battery Charger, Battery, UPS, Inverter, Rectifier, DC Power Supply, Gensets, Battery Vehicles, Battery Operated Systems, Industrial Battery Chargers etc.) Input: Single Phase or Three Phase. 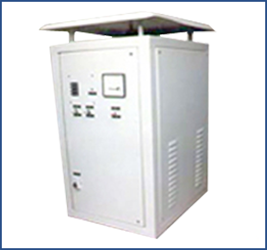 Servo Voltage Stabilizers : ( Category – Stabilizer, UPS, etc. ), Input : Standard range – 360 to 460…….. ( special range – 250 to 460 ), Output : 415 V +/- 1 %, suitable for Unbalance Line and Load variations. Power Supplies & Current Sources – For Testing of Battery operated Electrical components in vehicles –Testing of Solenoids, Head Lamps, Horns, Relays, motors, pumps. 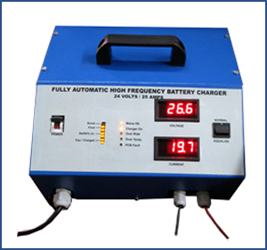 Battery Charger-Discharger – For Battery manufacturers – resellers – Charging & Discharging. Mag Demag units/Capacitor discharge units – For Electromagnetic lifters, EPM lifters, Electromagnetic Chucks, Grinding & Milling machines, Machine shop, Machining centers. Industrial rectifiers – For Electroplating industries. All products – For Export-Import Trading Organizations & Industries. Imported Equipment / Machines Users/buyers/ resellers, Steel Industry, Furniture manufacturing, Automotive Industry, MNCs, & all types of industries. The products are manufactured maintaining good Engineering Desciplines with Simple Assembly Ideas. The products are designed to look good and sturdy to perform the best. Products are documented for repeatability in manufacturing. Pune Satara Road, Pune – 411 009, Maharashtra, India. Tal. Haveli, Dist. Pune – 411041, Maharashtra, India.